New Ebola Vaccine Is Tested In Humans, After Success In Monkeys : The Two-Way The vaccine was developed by researchers at the National Institutes of Health and at Okairos, a Swiss-based biotech company owned by the British drug company GlaxoSmithKline. 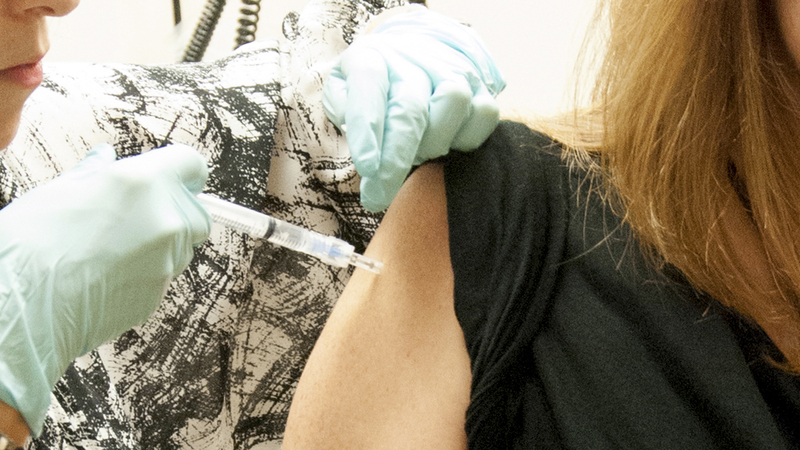 A woman receives a dose of a newly developed Ebola vaccine at the NIH Clinical Center in Bethesda, Md., last week, in a photo from the National Institute of Allergy and Infectious Diseases. An experimental Ebola vaccine is now being tested in people, according to scientists who say the drug has shown promising results when it was tested on monkeys. The small clinical trial is using healthy human volunteers in the U.S. The Ebola vaccine is the subject of a study published Sunday in the journal Nature Medicine. Researchers say the vaccine treatment includes a booster shot to help the immune system fight off the virus for months after it's first administered. "Researchers injected rhesus monkeys with the experimental vaccine and found it could protect the animals for as long as 10 months. The researchers say that's the longest any Ebola vaccine has been shown to provide protection against the deadly virus. "The National Institutes of Health began giving the vaccine to healthy people last week for the first time. The goal of that study is to make sure the vaccine is safe — and start to see if it might protect people. "The study's among several that researchers are rushing to start because of the Ebola outbreak in West Africa. But experts say it could take months to know whether any of the vaccines are safe and effective." "The investigational vaccine, which was designed by [Vaccine Research Center] scientists, contains no infectious Ebola virus material. It is a chimpanzee adenovirus vector vaccine into which two Ebola genes have been inserted. This is a non-replicating viral vector, which means the vaccine enters a cell, delivers the gene inserts and does not replicate further. The gene inserts express a protein to which the body makes an immune response." The early human tests are being conducted at the NIH Clinical Center in Bethesda, Md. The initial trial includes 20 adults, who received the vaccine in differing doses. Some results will likely come by year's end. The treatment was developed by researchers at the National Institutes of Health and at Okairos, a Swiss-based biotech company that was bought by the British drug company GlaxoSmithKline last year. "There is an urgent need for a protective Ebola vaccine, and it is important to establish that a vaccine is safe and spurs the immune system to react in a way necessary to protect against infection," says National Institute of Allergy and Infectious Diseases director Dr. Anthony S. Fauci. The news comes as another vaccine, developed by a unit of Johnson & Johnson, is moving toward human tests in the first half of 2015, as NPR's Shots blog reported Thursday. That vaccine targets the Zaire species of Ebola that's been causing misery in West Africa this year. And as the AP reports, "Canadian researchers created a similar Ebola vaccine that works in monkeys. Manufacturer NewLink Genetics of Ames, Iowa, said first-stage safety testing in healthy volunteers is set to begin in a few weeks." The current Ebola epidemic has killed more than 2,000 people in five West African countries, according to World Health Organization data. Trying to stop it, Sierra Leone has announced it will institute a public lockdown later this month, as we reported Saturday.